We're getting an extended break from days, no weeks, of rainy weather. After finishing work and errands Friday, Colleen suggested that we do a fire. I uncovered the wood pile and hoped it was dry enough to burn. It wasn't long before we had a nice fire going as we watched the sun set. I opted to enjoy O'Fest from Devils Backbone. 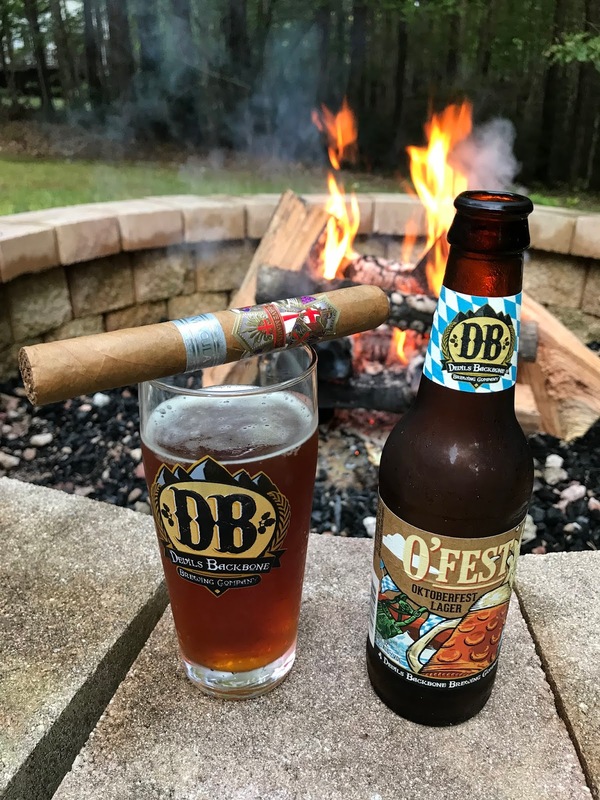 Despite gravitating to the hoppy beers in general, I always look forward to the Oktoberfest beers that fill the shelves and draft lines this time of year. The Devils Backbone offering pours an attractive dark amber color with a thin white head. The aroma has notes of sweetness, bread, and caramel. Rich, malty sweetness, bread, and a hint of grassiness greet the palate. I found this to be quite a tasty lager. I grabbed an Ave Maria Immaculata to smoke with the malt-forward beer. The flavors of the beer and the cigar were in harmony and were very fitting for fireside enjoyment. Soon enough I had to go inside to get a refill for my glass. Imagine my disappointment when I realized that the six-pack was empty and there were no more to be had. Sticking with the style, I did find a Sierra Nevada Octoberfest in the fridge. This one is, in my opinion, not quite as good as the Devils Backbone but certainly enjoyable. Soon the fire burned down, and our glasses were empty. With the approach of fall, I'm looking forward to many more evenings sitting outside around the fire pit.